JERUSALEM -- Children in Israel's south were heading to school early Wednesday as an Egyptian-brokered ceasefire took effect, putting an end to a brief yet intense flare-up with Gaza. The truce, announced Tuesday by Palestinian militant groups in the Gaza Strip, came after nearly two days of heavy shelling from both sides that had threatened to descend into full-blown war. Gaza's Islamist Hamas rulers said they would abide by the ceasefire as long as Israel did the same. Israeli Prime Minister Benjamin Netanyahu was under intense pressure on Wednesday for accepting the truce -- including from his long-time defense chief who resigned his position and indicated a possible political challenge. Israel's Home Front Command removed late Tuesday all limitations on southern residents, sending children back to school after two days in shelters. At the United Nations Security Council held urgent consultations on Gaza Tuesday, and the U.N. Secretary-General's Deputy Spokesman Farhan Haq told CBS News' Pam Falk that the global body had worked "very hard" with Egypt "to ensure that there is a return to the ceasefire arrangements of 2014." The U.N.'s Special Coordinator for Middle East Peace Process, "believes that it is possible to deescalate this current round of violence in the interest of both Palestinians and Israelis," Haq told CBS News. A diplomatic source close to the negotiations told Falk, however, that the "situation remains very precarious and can blow up again." Netanyahu was forced to defend his decision to abide by the truce on Wednesday, facing sharp criticism from some Israeli citizens and the resignation of his defense chief, all of whom saw the move as a contrition to Hamas. Israel's hardline Defence Minister Avigdor Lieberman, who made it clear on Tuesday that he did not support stopping the strikes, told lawmakers on Wednesday afternoon that he was resigning from his post and calling for early national elections. Lieberman officially announced his move later Wednesday in a televised address. He called the acceptance of the truce "a capitulation to terror." Residents in the Israeli border town of Sderot, which is regularly hit by rockets from Gaza during flareups, were irate that Israel's military was holding its fire. "Our government is doing whatever it wants, that's it. It only let us suffer, nothing more. We are third class (citizens) here in Sderot and (so are) the communities at the border with Gaza, not only Sderot," resident David Maimon told The Associated Press. "It's a shame instead of helping us, let us live quietly, they let us suffer. We only suffer, for 18 years we have been suffering." Herzl Zigzag, another Sderot resident, told the AP that he would "never vote for Netanyahu." "People here are traumatized. Gaza is victorious, what is this nonsense? It can't continue like this," he said. But speaking later Wednesday at a ceremony to honor the founding father of Israel, David Ben-Gurion, Netanyahu said that, "in times of emergency, when making decisions crucial to security, the public can't always be privy to the considerations that must be hidden from the enemy." After an Israeli security cabinet meeting that reportedly lasted some six hours on Tuesday, a statement was issued saying the ministers "instructed the (military) to continue its operations as necessary." Will Israel's "Iron Dome" help bring peace? Ashkelon is just eight miles from the Gaza border, and as CBS News correspondent Charlie D'Agata reported on Tuesday, that makes it an easy target for Palestinian rockets. 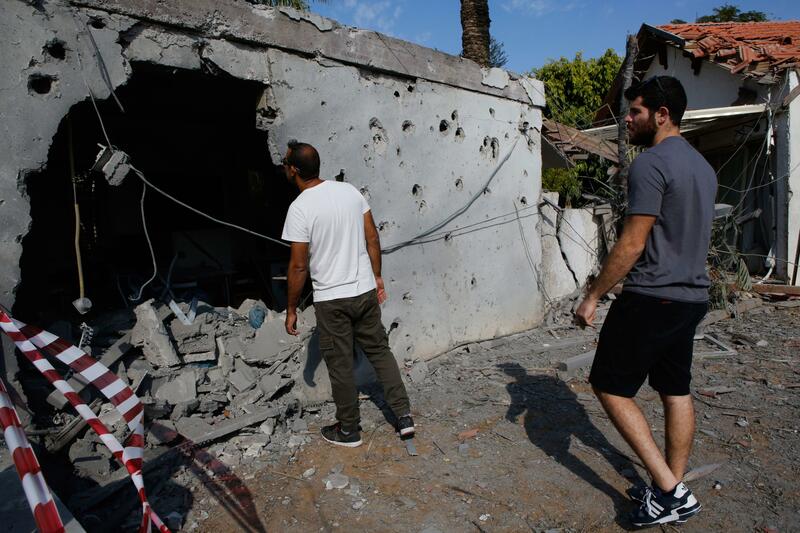 D'Agata and his crew saw the aftermath on Tuesday of one of the Hamas rockets, which hit an Israeli house. It blew a hole in the living room wall, where a woman was watching TV when the warning siren rang out. She begged her son to come with her to a reinforced safe room in the house, a move which may have saved both of their lives. Just minutes before the explosion, her son was in the shower. "That's a close call," Baney told D'Agata. "Within two seconds (after air sirens) we heard a huge boom, we saw our curtains flying in the air, windows (broken), and only after a few minutes when we went out, we realised that the missile had hit the building next to us," a man who lives near a block of flats hit by another rocket in Ashkelon said.